I was really looking forward to use them since they are really expensive and have a lot of good reviews on how amazing they are. I will do a update of this sheet mask since I want to really up my skincare game. I did the magic ring test a while back and I was shocked on how my skin was looking with the test so I wanted to get it better. I have had these masks since I tried the SK-II Facial Treatment Essence a few years back and I was just hoarding them just because I want to use them on a very nice occasion. Well, a few years has passed but there is no special occasion so I decided to whip out one of this mask to try. According to SKII site, it claims that your skin will be immediately and exceptionally immersed in moisturising, resulting in a visibly radiant and crystal clear complexion. 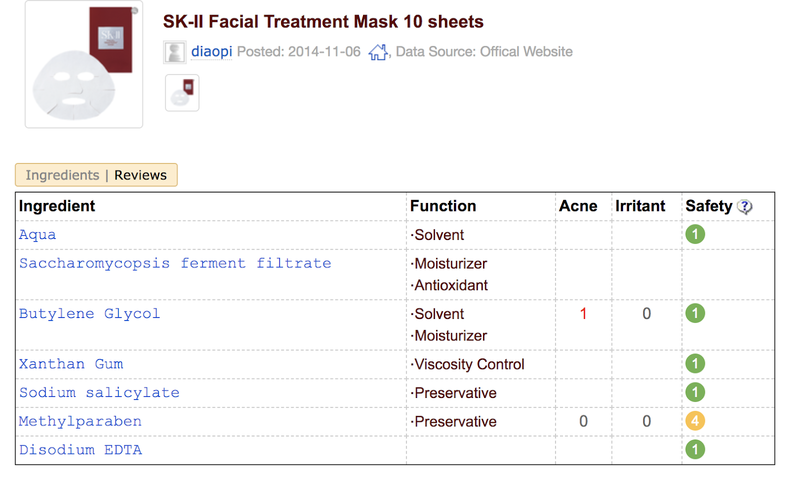 If you buy from the SK-II counters, one mask is around SGD23 but they are almost always included in the welcome kits or Pitera kits that SKII sells. The mask texture is not too thin nor thick and it is a soft material. It is made of cotton that is soaked in Pitera. Since the mask is not too thin, it is not easy to get tear while application. The fit is nice and easy to apply. It fits my face well and it has nice and big eye holes yet small mouth hole as I like. Although the mask itself is a little bit small for my face, it's not a big deal for me. The mask is soaked in the essence and the essence is not too thin or thick. It is not as watery but is easy to absorb in the skin. I was really excited about this mask and I really loved the fact that the essence is easy to get absorbed in the skin and the mask material is really soft and feel luxurious. There is that pitera scent that is also available in the Facial Treatment Essence. I left it on for 20 minutes as usual and I was surprised that my face is soaking the essence well. Although I'm using this mask as a final step after my moisturiser, the mask is still being soaked properly. After I removed the mask, I can see a glow on my face. I thought this mask is perfect for my skin and I can actually see a glow and radiant on my skin. Then, if you are asking why I give this mask a 2 stars out of 5 is because the next day I woke up, I have this weird film like substance peeling off from my skin. It is not my skin but there is this layer that is peeling from all over my face and neck. There is no expiry date on the mask so I'm not sure whether it's from expired products or what. Other than peeling, my skin feels radiant and hydrated which I really loved. If there is no peeling, I would have given this a 5 stars since I really loved it. I will try again since I still have a few more masks that is from a few years back and a few masks that I got recently. So, I will report back again in another post.